Rewa’s chequered past: A princely state with an unfortunate legacy of White Tigers ~ The Wandering Soul's Wander Tales.. Under the veneer of Rewa’s insipid “dusty little Indian town” feel is a treasure trove of forgotten history and an intriguing past that has comfortably faded into oblivion. 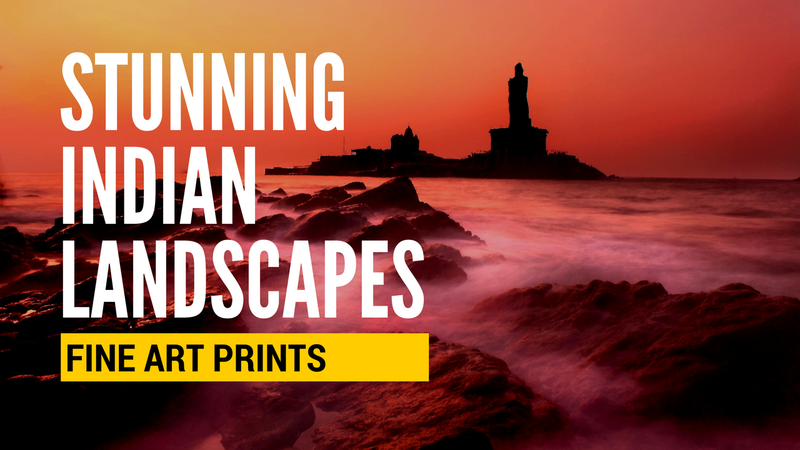 At first glance, I couldn’t understand what made Madhya Pradesh Tourism send me this way, to this obscure place with nothing remarkable in sight. Little did I know that I was actually being sent down the rabbit hole of vanished stories. Rewa is a little town in northeastern part of Madhya Pradesh and the erstwhile capital of Baghelkhand region in the past and Vindhya Pradesh in modern times, which was later merged into Madhya Pradesh. Today, you would be hard pressed to find anything evocative of the past glory but there are several mute witnesses in the form of crumbling and dilapidated ruins within the maze of modern constructions that tantalize you with the lure of a secret. 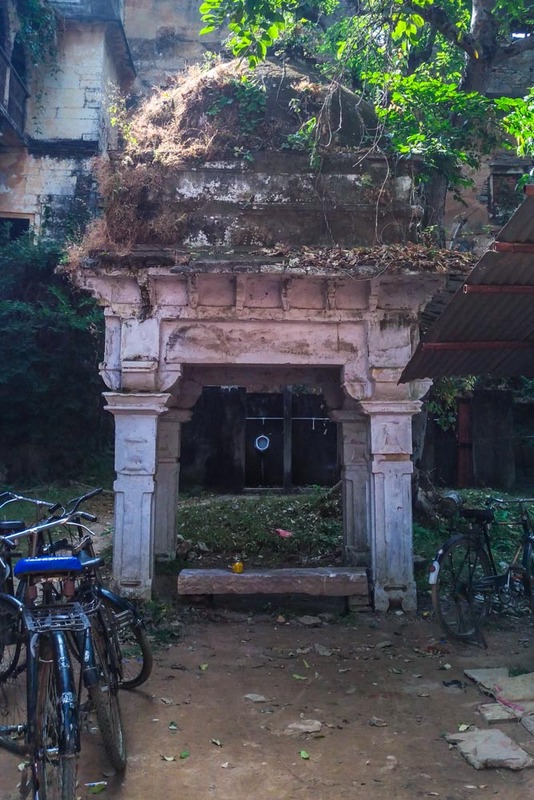 Walking along the banks of Rani Talab in the heart of Rewa I first noticed the remains of a temple with fragmented top and shrubs growing through the cracks in a dark corner. The next morning while looking for a museum of some sort, few more crumbling buildings in utter ruins scattered amidst the town came to my notice. 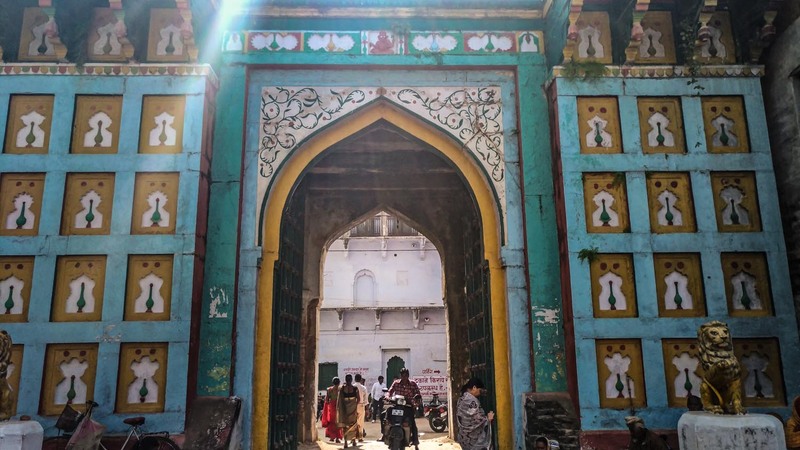 It was only when I entered the colorful fort gate that I realized Rewa was a place of consequence in the past but has now fallen into a chasm of despair stuck between negligence and bad memory. It was here that young emperor-to-be, Akbar, was given refuge for a while during which period he developed a close friendship with the prince of Rewa Ram Singh who would later go on to become the Maharaja of Rewa. In fact, two of the renowned “Navratnas” of Akbar’s court, virtuoso Tansen and ingenious Birbal were sent by Maharaja of Rewa kingdom after Akbar’s ascension to throne. Inside the fort was Baghel Museum, a dilapidated section of the fort renovated to hold various paraphernalia belonging to the Baghelkhand dynasty that ruled Rewa and the surrounding districts of Satna, Shahdol, Sidhi as well as Singrauli and Chitrakoot of Uttar Pradesh since 13th century. Geographically located next to the now famous Bundelkhand, Baghelkhand also holds similar treasures as its celebrated neighbour but is unfortunately ignored and forgotten for some reason. The only time Baghelkhand has ever come to the forefront of news was when the princess of Rewa came into limelight on silver screen for participating in Dance India Dance and embarrassingly enough when the museum was raided and looted by thieves who got away with historic artefacts worth crores! Despite the royal family still being alive and affluent, they have conveniently ignored their past treasures and maintained the museum only perfunctorily. There wasn’t a guide available knowledgeable enough to take me through the history of Baghelkhand and its rulers but the collection itself was quite fascinating. Ming vases gifted by the Chinese, delicate perfume bottles, weaponry and shields belonging to their soldiers, coat of arms and gifts from Queen Victoria among others were at display in a large hall. 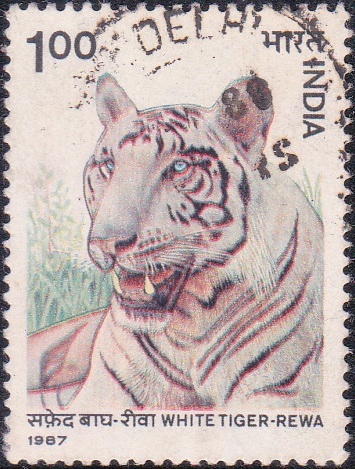 A commemorative postage stamp issued in 1987 featuring Mohan. In the adjoining room was the most treasured of Rewa’s riches, the taxidermied remains of Mohan, a white tiger captured as a cub in the wilds of Madhya Pradesh in 1951. White tigers are Bengal Tigers but with a recessive gene that causes absence of yellow coat color. Maharaja Martand Singh wasn’t content with just seeing this beauty in wild but wanted to lock it in like countless others who see no irony in restraining wonder. Mohan has since left behind an unfortunate legacy of fathering an inbred lineage of every known white tiger in the world at this point. Mohan was first mated with normal coloured Royal Bengal Tigress called Begum only to produce three litters of normal coloration. When that didn’t work, Mohan was then bred with one of his own daughters Radha and the ploy worked but it led to the beginning to downfall of the white tigers. Highly valued for their rare look of blue eyes, pink nose and the ethereal white coloration, White Tigers have been inbred to the point of no return causing several genetic deformities in litters and breeding depression among the tigresses producing offspring. Only after the inbred white tiger litters were visibly deformed did the practice of breeding white tigers with normal colored tigers take off to some degree of success. However, this has launched another chain of disastrous consequences where the normal coloured cubs are considered a useless collateral and killed instantly. 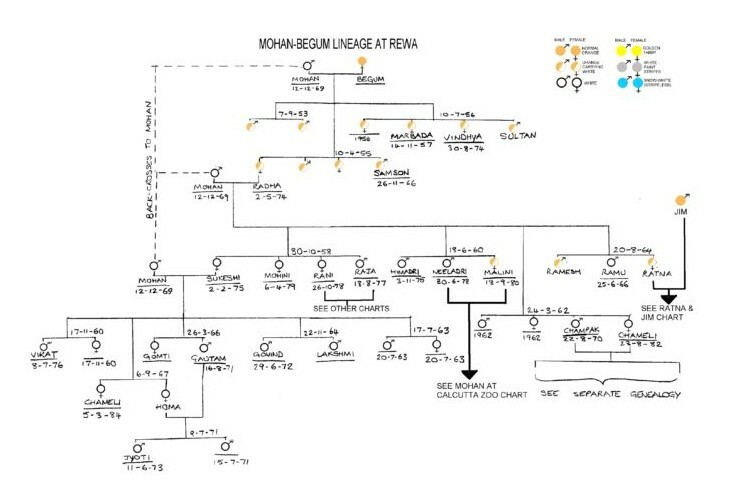 Mohan's lineage, he is the progenitor of all white tigers existing in the world today. Mohan is regrettably credited as being the first white tiger captured in the wild ever but that doesn’t seem to be true. What’s true is that Mohan was the last wild white tiger ever to be captured; they have been hunted to extinction since. Looking into the dejected blue eyes of life size stuffing of Mohan through the glass cage, where he is forced to persist till eternity, I sensed nothing but immense sadness come over me. Stuffed tigers are almost always preserved with an aura of ferocity in their demeanour. Not Mohan. There was neither pride in his dead eyes nor ferociousness in his likeness. In the later years of Maharaja Martand Singh, who first caught and encouraged the deplorable breeding of white tigers, he showed a surprising change of heart and diligently rallied for the establishment of Bandhavgarh National Park and protection of tigers in general. He succeeded in his efforts and even campaigned to end tiger hunts among royalty. But before you think this story has a happy ending, his son, current Maharaja Pushpraj Singh purportedly took on the mantle of wildlife conservation from his father. So what did he do with his clout and passion? He helped open a white tiger safari at Mukundpur where three white tigers in captivity are at display, costing a whopping 50 crores to establish. The saddest part of this story is that the next plan is to develop a breeding center to create more white tigers. Mohan would be rolling in his grave at our obnoxious obsession with his kind, if only he were buried! Have you heard of Rewa and its white tigers before? 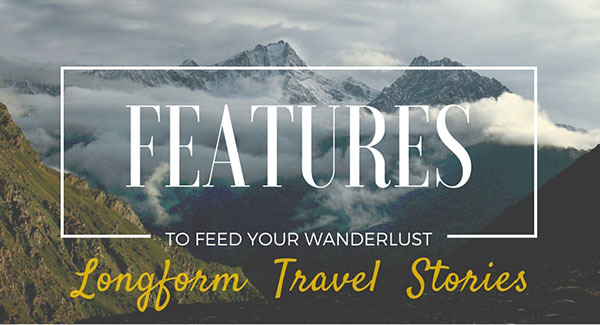 Wow Neelima, this is an amazing article you have written. What a narration of heart wrenching events. I don't know if I am moved more by the simplicity which you narrate or with the gory events surrounding the white tigers. Simply blown.